Some news can’t wait for the monthly bulletin and is posted as a News Release, as it happens. The Annual Village meeting will be held on Wednesday 1st May from 8pm. As in previous years the doors will open at 8pm and there will be a chance for you to have a welcome drink and then peruse the exhibition. This year there is also an opportunity to meet and chat to the candidates for the Parish Council elections due to be held the following day. The exhibition is filling up fast. There will be a large number of local groups and organisations to talk to about what they do. The agenda will be published in early April, so look out for details on the exhibition and who will be speaking at the meeting. Ahead of the Annual Village Meeting, the Hook Annual Report will be delivered to every household in the village. Information will also be delivered about the Echo Hotel Music Club/Hook Live gigs and the “Hook App”. The Community Centre Car Park will be CLOSED on Sunday 19th May, for the Annual Hook Fun Run and Road Races, which set off from Hartletts Park at 10.00 am. Why not come along and join in the fun ? Parish Council Elections are being held on 2nd May 2019. All twelve Parish Councillors will automatically retire at the end of their four-year term. A number of existing members have indicated that they will not stand again, so there will be a need for some new members. The closing date for nominations is the 3rd April, so please contact the Parish Council Office if you want more information about becoming a Councillor. Becoming a Parish Councillor is a great way to help make a difference in Hook. The Local Plan and Neighbourhood Plan will take affect this year paving the way to regenerate the centre of Hook. We also have many exciting opportunities for new sporting and recreation facilities. At the time of writing, there have been two gigs. The support for live music in Hook has been tremendous. This has prompted a request for Jazz and other types of music event. If you have a passion or interest in Jazz and other music genres and are willing get involved in bringing it to Hook, please contact the Parish Council Office. Please see page X for more information on dates and performers. The Neighbourhood Plan has now been submitted to Hart District Council. We would like to thank all the residents who took the time to input into this and respond to all the surveys and consultation. In particular, we would like to thank those on the Neighbourhood Plan Steering Group who gave up many weekends and evenings to create and complete the plan. Please see page X for more information. You should have received your Polling Card from Hart District Council for the Local Elections (both District Council and Parish Council) that are due to be held on Thursday 2nd May. At the Polling Station, you will receive two ballot papers. One for the Parish Council Elections and one for the District Council Elections. The Parish Council ballot paper will list all 15 candidates and you will need to select up to 12. To assist you in selecting the candidates you wish to vote for, they will be producing a shared leaflet which will be delivered to every house, detailing a little bit about each candidate to help you formulate who you may wish to vote for prior to the election. We understand that all the candidates will be present at the Annual Village Meeting on Wednesday 1st May so please do come along to meet and chat to the 9 current Councillors, looking to be re-elected, and the 6 new candidates. When completing the District Council ballot paper, you will need to select up to 2 of the 6 candidates listed. If this is your first time voting, the staff at the polling station will happy to explain what to do. If you wish to vote by post and amendments/cancellation of existing proxy votes, the deadline that you can register this with Hart District Council is 5pm Monday 15th April. If you wish to vote by proxy and this is a new application to do so, the deadline that you can register this with Hart District Council is 5pm Wednesday 24th April. This morning (22nd March 2019), on day 4 of the Inquiry, the developer WITHDREW their Appeal for permission to build 700 homes. This means the Inquiry Closed! Well done to all those who worked tirelessly to help build the evidence and present the case. Hook won out in the end. Apsley House Capital plc is applying to the Secretary of State (SoS) for Environment, Food and Rural Affairs (Defra) under section 16 of the Commons Act 2006 to deregister a strip of land at the junction of Newnham Road and London Road (A30), which is part of the Village Green (Jubilee Green, Newnham Road – VG Number. 138). 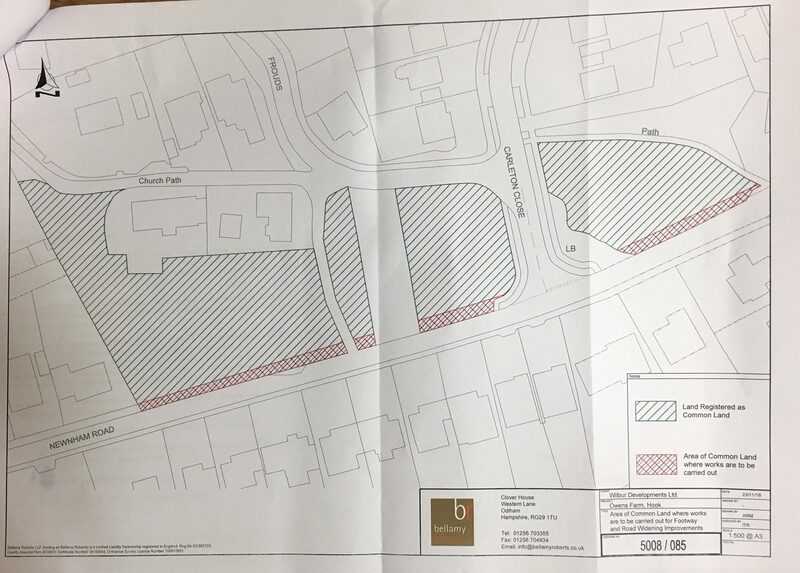 The purpose of this application is to enable the proposals for the development of Owens farm consisting of 700 dwellings (associated facilities) to be progressed. 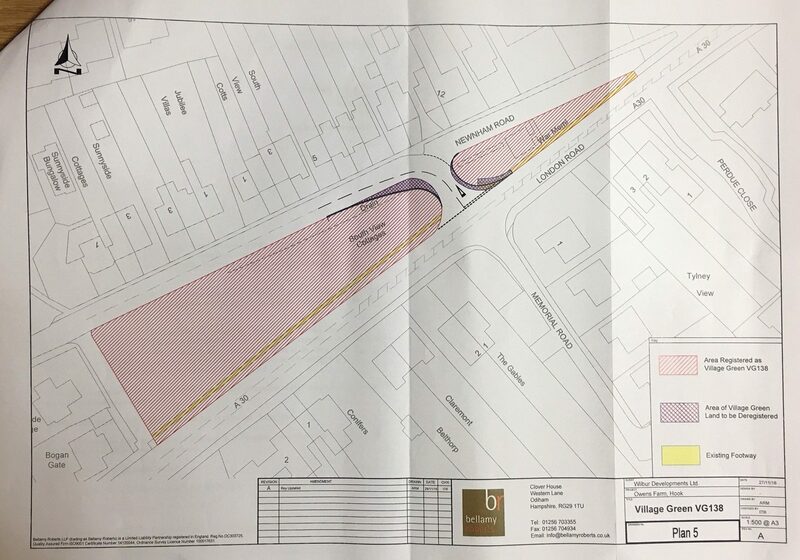 Under section 38 of the Common Action 2006 Apsley House Capital plc has also applied to the SoS to carry out restricted works on Hook common, which involves a strip of land either side of the junction of Carleton Close and Newnham Road. The proposed works are to widen this road to facilitate access by a proposed new public bus service and footway along Newnham Road. A copy of the application forms can be inspected at the office of Hook Parish Council, Hook Community Centre, Ravenscroft, Hook, RG27 9NN between 9am and midday Monday-Friday until 14 March 2019 or by appointment. The Parish Council Elections are being held on 2nd May 2019. All twelve Parish Councillors will automatically retire at the end of their four-year term. A number of existing members have indicated that they will not stand again, so there will be a need for some new members. We know that Hook if fortunate to have many residents that are passionate about our community and possess a wide range of skills and experience that can contribute to keeping Hook a great place to live and work. A willingness to work on new ideas is always most welcome! By being a Councillor is your chance to help make a difference in Hook. The Local Plan and Neighbourhood Plan will take effect this year paving the way to regenerate the centre of Hook. We also have many exciting opportunities for new sporting and recreation facilities. If you want more information on this rewarding role please contact the Executive Officer, Anne Atkins at the Parish Council Office for a chat by the 26th March. Closing date for nominations is by 29th March 2019. At the time of writing the first gig under the Parish Council new live music brand has a sell-out audience on the 16th February. Please see below for more dates. Hook has fallen victim to domestic burglaries more frequently. These have most recently been occurring in the afternoon between 4pm and 6pm. Also consider, registering your valuables with the national tagging service called ‘Immobilise’ at https://www.immobilise.com. This assists the police in returning any stolen property recovered to its rightful owner. On Christmas day a willing group of volunteers helped host lunch for 24 people who found themselves alone on Christmas Day. Not only did the guests enjoy a delicious traditional lunch with all the trimmings, they joined in with carols, bingo and a raffle. Santa made a visit to deliver goody bags for them to take home. This event was free for guests, due to the generosity of residents and local businesses who either donated time, money or goods. The number of guests has grown over the last few years and we hope to put it on again later this year (Dec 2019). At the January Parish Council meeting the Parish Precept for 2019–20 was set at £398,400. This means an average Band D household will pay £2.18 per week, equivalent to – less than a coffee at a local café. The Precept covers the running costs of the variety of facilities, land management and services provided by the Parish Council. We continue to offer free pre-application planning consultations and to work closely to finalise the Hook Neighbourhood Plan. We offer support to numerous local organisations, events and charities. Where possible we obtain additional funding to enable enhancements to the facilities in Hook.
. Closing date for nominations is by 29th March 2019. The Parish Council Elections are now 3 months away. All twelve Parish Councillors automatically retire in May 2019. Some existing members have indicated that they will not stand again, so new members will be needed. More important still, is that people with experience and skills gained either through experience or a personal interest in the area concerned to stand for election. These include an understanding of Highways, Community Safety, the Environment, Sports, Marketing and P.R. A willingness to work on new ideas is always most welcome! Please contact the Parish Council Office to find out more. Nomination forms will be available in late March and need to be lodged with Hart on a tight timescale. Election Day will be on Thursday 2nd May and the new Council will take office soon after. Many residents have been following the Planning application for 700 dwellings at the Owens Farm/West of Hook site. 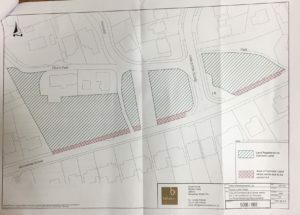 Despite Hart District Council rejecting the previous two applications, the developers have gone to appeal again. The date for the appeal is set for 19th March 2019. We will keep post updates on this latest appeal via the Parish Council’s website, Facebook, App and Focus. Following the Regulation 14 consultation in November/December, all comments have now been collated and the Steering Group is working on a final version to be submitted for the Reg. 15 stage of the process. 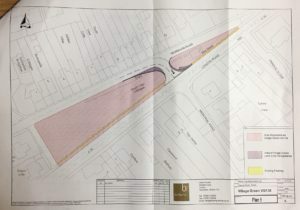 It is expected that the Final plan will be submitted to Hart District Council by early February. Following on from the launch of Hook Live, (the new Parish Council live entertainment brand), the Echo Hotel Music Club team has been busy booking original recording artists to perform in Hook. There are now 9 events booked to take place at Elizabeth Hall from February through to November. See page X for details of the events, bands, tickets etc. We are looking to bring other live entertainment to Hook, but this depends on volunteers to help arrange them e.g. Literary lunches, crafting and possibly cinema. If you are interested in any of these and would like help to organise these, please contact the Parish Council. The Hook Live! Brand is an umbrella for what we hope will develop into a wide range of live entertainment. The first part of the programme, will be delivered under the name ‘Echo Hotel Music Club’, which has been established to focus on events or gigs by original music artists and bands. You can check this out via the ’Hook Live!’ and ‘Echo Hotel Music Club’ Facebook pages. More information will also follow via the Hook App, Hook Focus magazine, posters and leaflets around the village. Gigs hosted by the ‘Echo Hotel Music Club’ will be held (mostly) at the Elizabeth Hall. The programme kicks off on Saturday 16 February 2019 at 7pm, with a band much in-demand and a music-festival favourite, the Rufus Black band. They will be supported by an exciting new talent of Jade Danielle Williams. Check out just how good these bands are by reading their biographies, view videos of them performing live and buy event tickets online via the links on the ‘Echo Hotel Music Club’ Facebook page – see below. All these bands are recording artists that are in great demand on the live music circuit and fill halls and concert venues all over the country and abroad. So, get your tickets early to avoid disappointment. Not only will you enjoy a rocking night of great music, performed by brilliant musicians, you will also be able to meet the artists themselves afterwards. For more information and to book tickets via the events section, please go to the following Facebook Pages.